The cases Dr. Coleman has attended give us all hope – if someone would just see us as individuals and not dollar signs. Readers will see through the telling of these few cases, she is very passionate and invested in what she does. She addresses dealing with angry, aggressive individuals by showing compassion and understanding, and yet speaks to them from the heart. Several times during her writing Dr. Coleman talks about seeing glowing lights behind her patients, which she relates as one’s guardian angel. The idea of seeing auras is fascinating, and I asked a friend of mine (whose doctor will pray with her) what she thought. She stated that prayer is powerful, even if one doesn’t attend church or believe in a God. I find myself moved by Dr. Coleman’s holistic approach and as a Psychologist I have used it myself with clients. Many, like myself, will silently say “No way,” does this work, but if one looks at the attitude and behavior changes these individuals present you may change your mind. Often many think we need a diagnosis to put on how we are feeling, but from the author’s point of view, we just need a little tune-up in how we see and react to life. Coleman’s writing is uplifting, with no lectures, blaming, or criticizing, which I loved. It is easy to read and will challenge you to talk to your doctors about what you feel and need. I do think one might be surprised at the outcome. 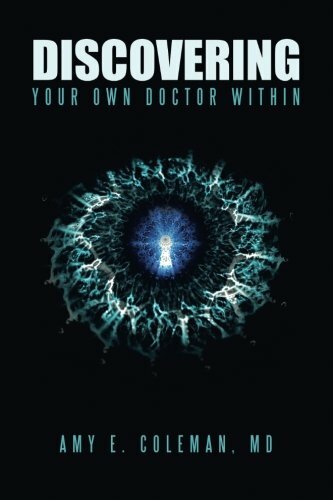 I highly recommend “Discovering Your Own Doctor Within” by Amy E. Coleman, MD. You will find it challenges your acceptance of how you should be treated by medical personnel.